Information about more than 3,300 U.S. Electric Utilities at your fingertips. How many Megawatt Hours of electricity did a given utility deliver to its customers in the year? How many customers does it serve? How much revenue did it derive from its operations? Filter data on several criteria or search for a utility by name. Data is derived from EIA Reports, so the data is authoritative. Data is for 2014, the most recent complete data set available from EIA. • Displays utility name, number of customers, and Megawatt Hours. Configurable to show residential, commercial, industrial, or total. • Tap a utility to see more details, with Utility operations broken down by state. 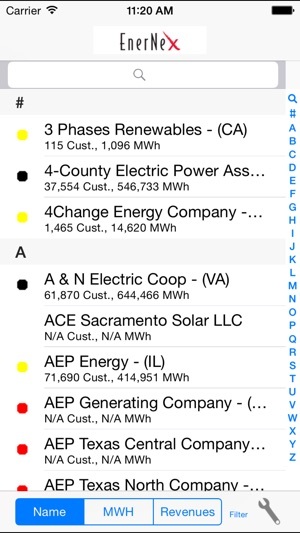 • Sort utilities by name, Megawatt Hours, or revenue. • Filter utilities on several criteria. • Great for utility industry users or for consumers wanting to learn more about the industry. • Data is self‐contained in a built‐in database, no network connection required. Search for information about utilities anywhere, anytime. • Data source: U.S. Energy Information agency, Form EIA‐861 Final Data File for 2014, http://www.eia.gov/cneaf/electricity/page/eia861.html, accessed January 4, 2016. Updated with most recent EIA data- 2014. Nice app that does the job seamlessly. Helps me check power stats on the go, particularly while I'm remaining anonymous. 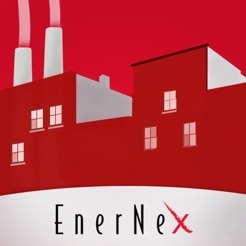 Nice job Enernex! !